AMARILLO, TX (KFDA) - As residents of the communities they serve, employees of the Amarillo office of Spherion Staffing Services, a recruiting, staffing and workforce solutions provider, see the needs of their neighbors each day. 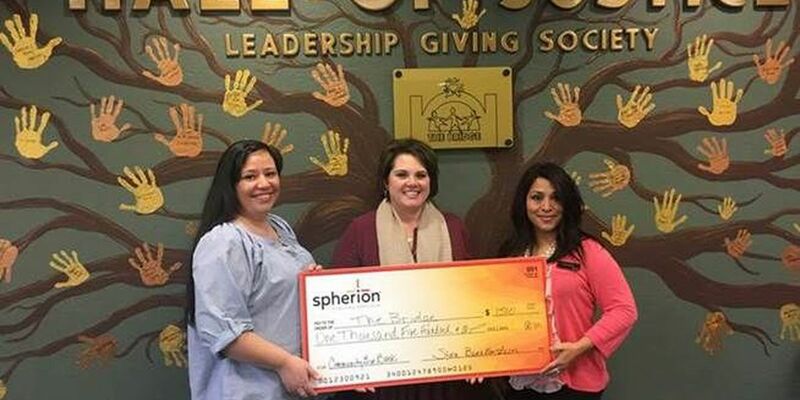 That's why the Amarillo Spherion is turning compassion into action by donating $1,500 to The Bridge Children's Advocacy Center as part of its annual Community Give Back program. Amarillo Spherion branch owner, Stan Benkenstein, has a heart for children and hopes one day child abuse will be a problem of the past. Benkenstein hopes Spherion's donation will go a long way toward continuing its services for children in the Amarillo community who need it. The Bridge is a program for children that assists with child abuse investigation. Children are referred through either Child Protective Services or Law Enforcement. "The meaningful work The Bridge does impacts all of Amarillo by providing resources and support for initiatives that help the children of Amarillo thrive," said Benkenstein. "The Bridge is an outstanding organization, and we are delighted to recognize and reward them as part of our Community Give Back program. We are honored to support the essential work they do today and will do in the future." Now in its third year, Spherion's National Community Give Back program is proud to recognize and advance the work of local charitable organizations that puts others first. As part of the program, each local Spherion franchise owner thoughtfully selects one or more nearby community organizations to receive a special contribution. Since starting the initiative in 2014, Spherion's Community Give Back efforts has rewarded nationwide recipients with nearly half a million dollars.